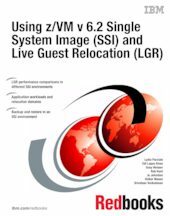 In this IBM® Redbooks® publication, we expand upon the concepts and experiences described in "An introduction to z/VM Single System Image (SSI) and Live Guest Relocation (LGR)", SG24-8006. An overview of that book is provided in Chapter 1, “Overview of SSI and LGR” on page 1. In writing this book, we re-used the same lab environment used in the first book, but expanded it to include IBM DB2® v10 on Linux on System z®, two IBM WebSphere® Application Server environments, and added a WebSphere application, used for performance benchmarking, which provided a workload that allowed us to observe the performance of the WebSphere Application Server during relocation of the z/VM® 6.2 member that was hosting the application server. Additionally, this book examines the use of small computer system interface (SCSI) disks in the z/VM v6.2 environment and the results of using single system images (SSI) and live guest relocation (LGR) in this type of environment. In the previous book, a detailed explanation of relocation domains was provided. In this book, we expand that discussion and provide use cases of relocation domains in different situations. Finally, because the ability to back up and restore your data is of paramount importance, we have provided a discussion about how to use one tool, the IBM Backup and Restore Manager for z/VM, which can be used in the new z/VM6.2 environment. We provide a brief overview of the tool and describe the changes in the installation process as a result of using single system image clusters. We also demonstrate how to set up the configuration file, and how to back up and restore both a user and an identity. This publication is intended for IT architects who will be responsible for designing the system and IT specialists who will have to build the system.